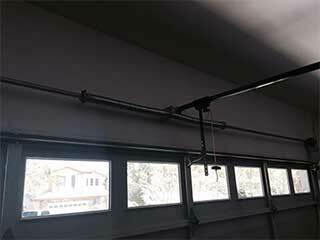 Springs are one of the most important garage door components. If you ever hear a loud bang noise from your garage and find your door stuck shut, uneven, or opening at an unusual pace – these parts are most likely to blame. At Garage Door Repair Chula Vista we know everything about how springs should function, and can provide you with quick and affordable solutions tailored to your needs. We have the expertise to take care of any problem and we'll do it as quickly as possible! Think you might have a problem with one of your springs? Read on to see how we can help! Sometimes springs only need a bit of adjustment. You can tell by checking the door's balance – if it looks uneven (one side higher than the other), or slightly saggy. If that is the case, we can provide you a quick assessment and adjustment so you'll have your door up and running like new in no time. Our knowledgeable and friendly team covers all types of torsion and extension springs from all the major brands available on the market. Sometimes adjustment wouldn't cut it, and in these situations your garage door springs may require replacement. We can offer you pertinent advice on replacing them and make sure we only use replacements that are suitable for your particular type of door, as its size and weight are the main factors in the choice of these parts. What's even better, we offer a same-day service so you can always count on us in an emergency, no matter the problem! Regular care and maintenance can extend the lifespan of your door and springs. You can avoid dealing with broken springs if you make sure to keep them in check. If they are worn, look somewhat "stretched" or rusty – it might be a good time to get a new set installed. Prevention is always better than a cure. If you are looking for a professional team to keep your garage door parts in check every year, we're here to help. With our comprehensive range of maintenance services, you can make sure your door gets all the attention it needs to work as it should at all times. Give us a call today for same day service, or contact us online for any question!